A season of exhilarating highs and consistent improvement for the George Mason University men’s basketball team came to a close on Friday afternoon, with the No. 5 seed Patriots falling to No. 4 Saint Joseph’s in the Atlantic 10 Quarterfinals. George Mason (15-16, 9-9) could not withstand a shooting barrage from the visiting Richmond Spiders, falling 93-79 on Saturday night inside EagleBank Arena. It’s becoming quite evident that “Big Shot” Ian Boyd has a flair for the dramatic. With less than a second to go and the George Mason University men’s basketball team trailing VCU 80-79, Boyd gobbled up an offensive rebound and converted a second-chance tip-in to give the Patriots their first win in the Siegel Center since 2011. For the second time in as many games, sophomore Ian Boyd scored at the buzzer to send George Mason home with another incredible, last-second victory. It was déjà vu all over again for the George Mason University men’s basketball team Wednesday night in Philadelphia, as Ian Boyd hit a 25-foot buzzer beater as time expired to give the Patriots their second walk-off win of the season over Saint Joseph’s. George Mason (12-14, 6-7) played arguably its most complete game of the season in an 85-67 Valentine’s Day triumph over Dayton inside EagleBank Arena. George Mason fed off a raucous Homecoming Weekend crowd to grind out a 72-65 victory over George Washington on Saturday afternoon inside EagleBank Arena. George Mason (10-14, 4-7) held a double-digit second half lead, but Fordham hit a barrage of 3-pointers to rally past the Patriots 67-66 on Wednesday night inside historic Rose Hill Gymnasium. George Mason erased deficit after deficit and put forth an extraordinary effort Saturday in the Palumbo Center but it wasn’t quite enough to capture victory, as the Patriots fell to Duquesne, 95-89, in double overtime. George Mason dropped an 80-68 contest at George Washington on Wednesday night inside the Smith Center. Juniors Otis Livingston II and Jaire Grayer combined for 51 points to power the George Mason University men’s basketball team past Saint Louis, 86-81, on Saturday afternoon inside EagleBank Arena. George Mason junior Otis Livingston II brought the Patriot faithful to their feet with a last-second 3-pointer to give the Green & Gold an 81-79 victory over visiting Saint Joseph’s Wednesday night inside EagleBank Arena. George Mason dropped its home A-10 opener to hot-shooting Davidson, 86-59, on Sunday afternoon inside EagleBank Arena. George Mason dominated the overtime session during a resilient 80-72 victory at Massachusetts on Wednesday night inside the Mullins Center. George Mason dropped an 83-64 contest to preseason Atlantic 10 favorite Rhode Island on Saturday in the conference opener for both teams. George Mason outscored Morgan State 54-37 in the second half en route to a 86-79 win over the Bears Friday night inside EagleBank Arena. George Mason upset No. 19 Coastal Carolina for a 2-1 victory in the season opener on Friday night. Tournament officials for the 2017 Men’s Cancun Challenge have put the initial matchups together. George Mason University head coach Dave Paulsen has announced the addition of University of Virginia transfer Jarred Reuter. George Mason women’s basketball coach Nyla Milleson has announced the addition of Connecticut graduate transfer Natalie Butler. George Mason senior Marquise Moore has earned an invitation to the prestigious Portsmouth Invitational to be played April 12-15. George Mason basketball will lose three sophomores to transfer, the program announced Friday. George Mason fell to Loyola (Md.) by the score of 73-58 on Wednesday night inside EagleBank Arena. George Mason has earned its first postseason berth in four seasons. 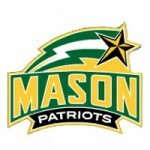 George Mason (20-13) could not push past No. 2 seed VCU in the A-10 Tournament. George Mason completed one of the most improbable comebacks in program history Thursday. George Mason has earned the No. 7 seed in next week’s Atlantic 10 Championship and will face off with Fordham in second round action. George Mason (19-12, 9-9) wrapped up the regular season with a 72-60 setback at VCU. George Mason (19-11, 9-8) sent its seniors out in style, grabbing a 63-62 win over Duquesne. George Mason shot the ball well and controlled the glass, but could not overcome George Washington. George Mason (18-10, 8-7) withstood a number of punches from one of the Atlantic 10’s best teams. George Mason erased an 18-point second deficit but couldn’t make a final push, dropping a 77-74 contest to Rhode Island. George Mason (18-8, 8-5) put together a lovely Valentine’s Day effort en route to its fourth-straight win. George Mason (17-8, 7-5) sent a Homecoming crowd of 6,676 home happy with a 73-67 victory over Fordham (10-15, 4-8) on Saturday. A pair of senior leaders made huge plays down the stretch to propel George Mason past Davidson. George Mason (14-8, 4-5) dropped a double overtime contest at Saint Louis, 76-74. George Mason went into New England and pulled out a 76-74 victory at UMass on Saturday afternoon inside the Mullis Center. George Mason dropped a 87-68 contest to hot shooting George Washington Wednesday night inside EagleBank Arena. George Mason (13-6, 3-3) bounced back in a big way Sunday, knocking off Richmond 82-77 before a capacity crowd inside the Robins Center.